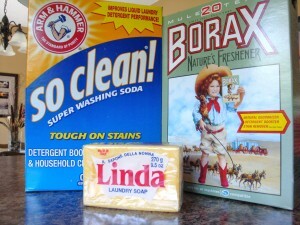 I don’t know about you, but have you noticed the price of laundry soap these days? Whether it is in liquid or dry form (do they still make dry form? ), you pay a pretty penny for what seems like 20 loads worth along with a whole lot of wasteful plastic packaging. 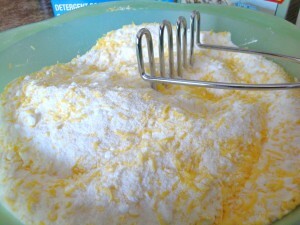 So late last year (around Christmas time), I came across a recipe for a home-made laundry soap and decided to give it a whirl. I wanted to test drive the formula first before writing up a blog post and I must say that after 5 months of using the home-made stuff, I am hooked. I will no longer go back to buying commercially made laundry detergents. It cleans just as good as any commercial product for a fraction of the price and without the use of perfumes and chemicals. 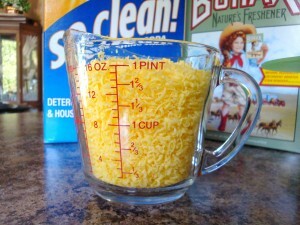 The bar of soap I purchased grated to exactly 4 cups worth, and the recipe is equal parts of the 3 ingredients. Measure out all the ingredients into one large bowl and using a potato masher, combine the ingredients until thoroughly mixed. 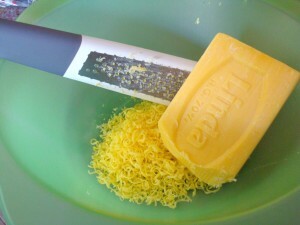 Once combined, transfer the laundry soap to a re-sealable container (I picked this 12-cup one up at the dollar store) and then just use an old 1 tablespoon scoop to dispense from. 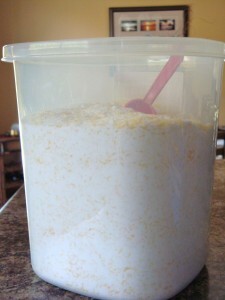 For a small to medium load, use one scoop, for larger loads or those that are heavily soiled, use 2 scoops. Now I have just made my second batch of detergent since the beginning of the year, and we do about 4 loads of laundry a week, so 12 cups of detergent lasted me about 18 weeks… that is 72 loads of laundry! So how this that for saving money? Works for me! Note: This detergent is very low in suds, so it is safe to use in frontload HE machines. Wow … I think I’ll check that out. I have a co-worker who will love this. Thanks Deb! hi, just found your site, as i was looking thru friends lists for friends of friends… anyways… I have pretty much this same recipe for laundry soap, only it’s made into a condensed liquid. It works much better here in our water as we have extremely hard water, and when I’ve used washing soda or borax in the past in my machine, it doesnt break up. Anyways, you are right, it is a very good soap, and I liked the results. My problem is that i missed the suds, if you can believe that. How brainwashed are we, eh? ps, i didnt notice where you are from, maybe if i check your home page? anyways, I’m originally from around north of Archerwill, Sask, but my home has been here in the Sunny Okanagan for the last 25 yrs now. The soap is actually PREFERRED by HE machines as they are LOW to NO suds! I have been using this stuff since January and have noticed no difference in cleanliness of clothes, more imortantly, the Borax helps eliminate odours. This is great, I will give it a try. Can you confirm that it is septic safe?